I think many people know about online storage which that online services allow people store some files, such as documents, photos, videos, music. If you like you can share files with other people, let they download or play. That called personal networking, you can set it up public or personal. Drop.io is an online private storage, that allows you store your files and share them with your family or friends. But it is not a regular online storage service, you can use it without register. It is very simple to use it, set a password for your account, that automatic exist at once. You can use that password sign in, you have a single web page that allows you upload your files. you set a time for how long to keep your web page, a day, a week, a month, a year. You can set viewer limited action, only view or can add comments. It is really cool. 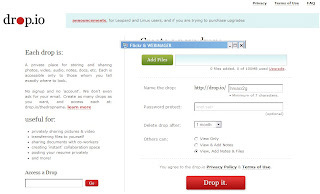 It is simple and safe, you do not need offer any your personal information and email. Your files are not be searched, and not networked with other users.